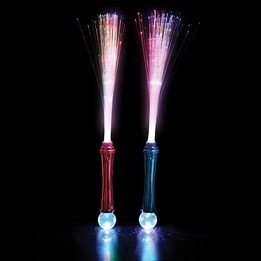 The fiber optic wand LED multicolor measures all in all 15 inches of length. Sold in packs of 12, there are 6 wands with blue handles and 6 wands with pink handles . This light-up product will be a success during festival. Completed also for parties of any kinds. 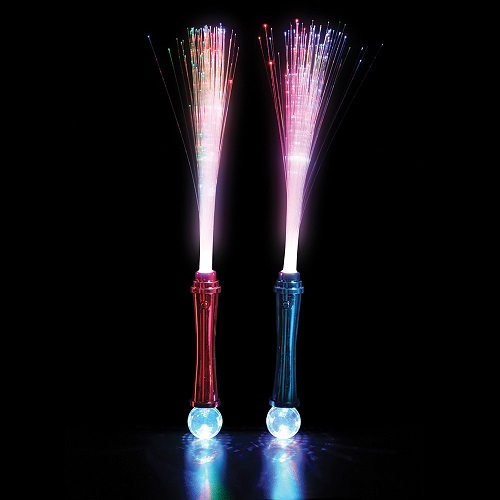 Besides holding it in our hand, this wand can very well serve as decorative object for table centerpieces or be arranged in the deliberate place. Wands can be of use to various special occasions such as: weddings, Bar-Mitzvah, dances, concerts, disco parties and carnivals. You press on the small switch on the handle of the wand to select 1 of 3 multicolored entertainments of your choice with colors (blue, green and red). Excellent value because the article will be reusable for various evenings of festivities. This product is not recommended for children under 5 years old.